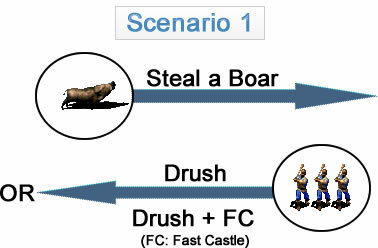 Some may argue that stealing boars and sheep early on is unfair while some would say “It’s part of the game”. When I was noob I personally used to get offended when someone steals one of my boars or my last two sheep. I was offended in way that I was waiting for any window of opportunity to pay them back. Occasionally my opponents asked for a pause but I didn’t allow it. Or when they drop I did not save. Salt was coming out of my nose every time I was lamed or lose to those shenanigans. Only back then I was an angry noob and didn’t know how to play age of empires 2 without boars and sheep. Until I came across KKab replays. Those have changed my salt levels 180 degree. 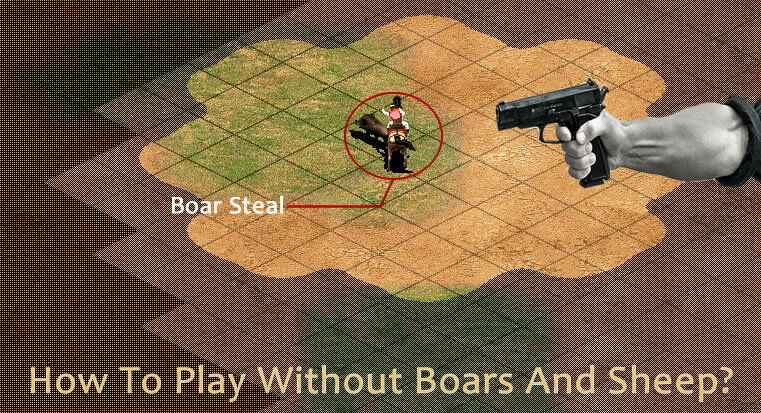 Today, I will be showing you how to play Age of Empires 2 without 1 or 2 boars; without 2, 4, or 6 sheep. I will also add recorded games to download at the end of every section for you to watch on Steam/Voobly. 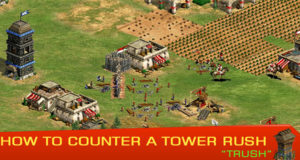 Again credits to Kkab, one of the legends of Age of empires 2. When a Boar or Sheep steal take place? 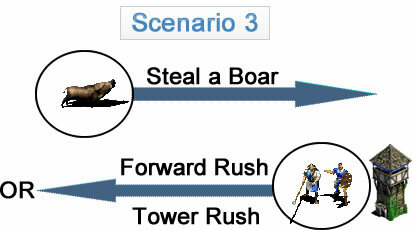 The boar steal usually takes place around the 3 – 6 min mark. 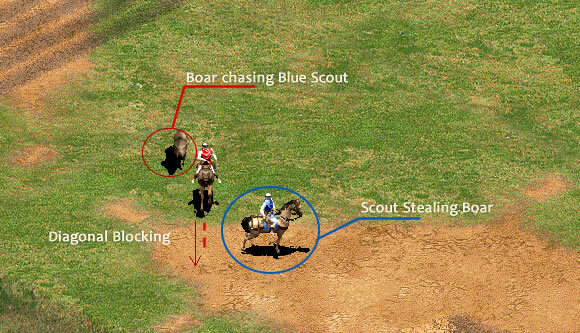 Use this tip to have your scout nearby your boar in Patrol/Aggressive stance. 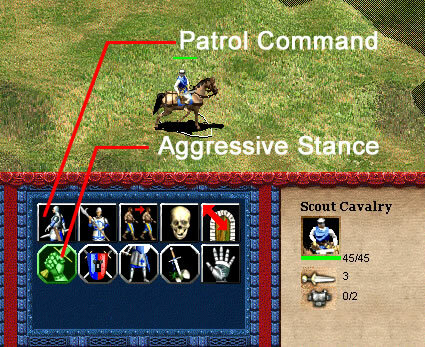 You may be able to scare your enemy away or you can try to block his scout from stealing the boar by moving your own scout diagonally between the running boar and the enemy scout. Sheep steal usually occur around 2:10 – 6 min and sometimes later. The only tip I can give you to practice scouting your base better. 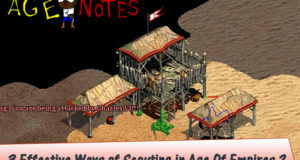 I recommend this guide : Step By Step Scouting For Beginners in Age of Empires 2. It is also important to scout your enemy so you can anticipate him and then it’s up to you whether to play defensive or aggressive. However if your boar is stolen, do not panic. 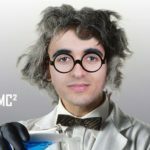 As throughout this guide you will learn how you can easily play without it. 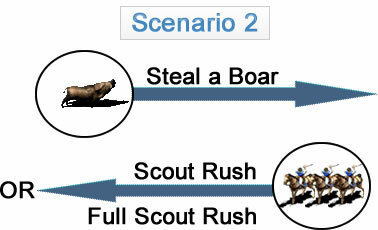 Tip: A drawback to stealing a boar is a scout with less hp. Try to chase the low hp scout and kill it, preferably when you are about to hit Feudal age. This way you reduce his scouting information then you can use that to your advantage and send a villager to build a tower behind his lumberjacks or do an unusual strategy to take him by surprise or slow him down. How does a lamer think? If you have loom (Population 12) becomes (Population 11), etc. 3:20 min (12 Population) This Villager that comes out should lure the other boar (meanwhile you are consuming a sheep. 3:45 min (13 Population) Bring down the boar and now you should have 9 villagers consuming the boar. Remove 1 villager from the boar and send it to berries (you only need 8 on boar). Build a mill whenever you have 100 wood. 5:25 min (17 Population) This villager goes to berries (total 5 foragers). Your boar is done now. Just start consuming sheep. And make a farm whenever you have 60 wood. 6:15 min (19 Population) This villager takes any struggler “tree” near your town center. You have two farms now and need to make a third farm soon. 7 : 30 min (22 Population) This villager also joins lumberjacks (total 5 lumberjacks); also Research Loom. 7:55 or 7:45 min (22 Population) At Loom researched! Click Feudal Age. And villagers that are done with sheep set them to take nearby struggler trees for few seconds. Then Grab 5 villagers from strugglers to build a new lumber camp. 2 Villagers left on strugglers should build a barracks at 60% – 70%. Meantime you may try to find enemy scout. Because when you reach feudal age your scout becomes faster than a Dark Age scout. So you can chase it and kill it easily. Once you reach Feudal age you can build your stable as if nothing happened. Maybe your build order is now even better with 3 farms. 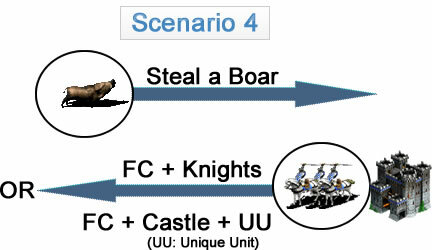 There is only 1 chance out a 100 for this to happen, especially if you have 2 forward boars at the same spot. Nonetheless, it is still worth a mention. In this situation, it is exactly like “How to Play without 1 Boar”, You just need to lure 2 or 3 deers. 2 sheep may not sound as much but it is 200 food. That’s a lot of food lost, because Horse collar and double bit axe feudal upgrades together cost 175 food and 125 wood. So without those two sheep, either your feudal age upgrades would be delayed or you will have to cut off army production to be able to upgrade which is not ideal. So how could you recover the 200 food lost? Answer 1: 6 Foragers instead of 4 foragers and 2 Farmers. Answer 2: Lure 1 deer, 5 Foragers instead of 4 foragers and 2 farmers. By the time you are luring the 2nd boar, you should already have 2 or 3 foragers. Then every villager that comes out of the town center goes to forage bushes until you have 6. At 5:25 min (Population 17 “without loom”) This villager becomes a hunter (boar meat). And build a Farm. At 6:15 min (Population 19 “without loom”) This villager becomes a shepherd. And you should have 2 farmers already or in the process of building the 2nd farm. At 7:20 (21 pop) or 7:40 (22 pop) min research loom and click feudal age afterwards. Grab 5 Villagers from sheep and put them on struggler trees for few seconds. Then send them to build the second lumber camp. Now you have a total of 10 Lumberjacks, 2 farmers and 2 villagers under your town center consuming what’s left of the sheep. At 90% Send another villager from sheep or forager to assist the barracks builder. At Feudal age, build a stable or an archery range. At 5:00 min or 5:25 min: You should be luring the second boar. 5:30 min mark you need 4 foragers already and next 2 villagers also as foragers. And build farms as soon as you have 60 wood. At 6:40 min (20 Population) This villager as a lumberjack. Once the boar is done , set the idle villagers to take struggler trees. At 7:30 min (22 Population) This villager as a farmer and Loom. At Loom researched: Click Feudal age and (slowly) move 5 villagers from strugglers to build a new lumbercamp. Now total of 10 lumberjacks. At 90% To Feudal age: Send another villager from struggler or forager to assist barracks builder. At Feudal age researched: Build Stable. I don’t see this ever happening! But you can follow “How to Play without 4 Sheep” and lure an additional deer. That’s all. At 5:25 min (Population 17 “without loom”) This villager becomes a shepherd. And build a Farm. At 7:40 (22 pop) min research loom and click feudal age afterwards. Grab 5 Villagers from sheep and put them on struggler trees for a few seconds. Then send them to build the second lumber camp. Now you have a total of 10 Lumberjacks, 2 farmers and 2 villagers under your town center consuming what’s left of the sheep. This guide should have thought you how to keep up with your build order without boars and sheep. 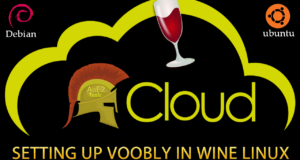 You just need to practice versus any AI the situations labelled with ‘(Common)’. Practice at least 3 games per day until you become flexible and impulsive. 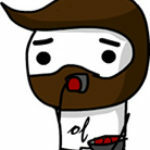 And remember to always have fun when you jump into any multiplayer game and beat those evil lamer lol. Let us know in the comment section if you have any question or queries.